DURING his campaign in 2016, President Rodrigo Duterte promised to undertake a constitutional reform that will change the country’s current unitary system of government into a federal one. His appointed consultative committee has already come up with a draft charter to replace the 1987 Constitution. However, “the revision itself has not yet formally started,” Department of Political Science Chairperson Dennis Coronacion clarified in an interview with the Flame. Is it truly necessary for the Philippines to adopt a federal form of government? For Coronacion, federalism is “an advantage” because it will empower the local government units (LGUs) by allowing them to make decisions by themselves since the current form of government considers LGUs as subordinates of the national government. 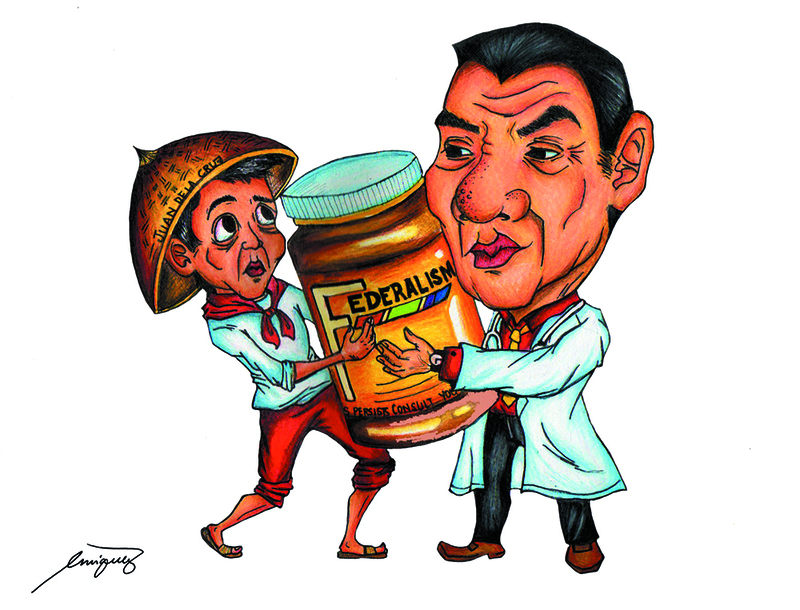 “The implication is the LGUs have no freedom to decide for themselves. It’s always the national government. Ang epekto niyan is there are problems in the local experience which cannot be solved by ideas and solutions that have been produced by the national government,” he said. Further, Coronacion said federalism will be a good opportunity for the country to experience political reform since some LGUs’ politics are aligned with that of Malacañang. With the passage of federalism, “political butterflies will be lessened” since some powers of the national government will be transferred to LGUs, he added. “[Ngayon] na mahina pa ‘yung kapangyarihan ng LGUs, namamayagpag na ang local political dynasties. Mas lalo pa kaya pag i-increase mo ang kapangyarihan ng mga LGUs,” he said. Kabayan Deputy Majority Speaker Rep. Ron Salo echoed Coronacion’s support for federalism, saying decentralization will empower LGUs to come up with laws that will be beneficial for their constituents. However, he also said the objectives that the LGUs would like to achieve will determine whether the creation of more autonomous states will be a good thing, especially since some LGUs are not capable of maximizing their resources. “We hope that when they are empowered by the federal form of government, they will really take the lead […] that particular responsibility is not [in] being autonomous when it comes to the powers that they have, [but] in reaching and realizing the development of their constituents especially in the health, economy, education, housing, and all other sectors,” Salo said. On issue of budgeting, according to a research by the National Economic Development Authority (NEDA), P253 billion will be spent on shifting to a federal form of government. This will cover additional costs such as salaries of governors and regional government staff and the operating expenses of their offices, salaries of three to seven senators per region and other expenses of the state government. Assuming that 17 regions will be created, NEDA estimated that the cost of setting up a federal government ranges from P44 billion to P51 billion, while Senator Aquilino Pimentel’s proposal costs P66 billion to P72 billion. Moreover, NEDA said budgetary concerns in regionalization will also need to be considered since some regions are “very poor” in terms of income, hence the difference in the degree of self-reliance of LGUs across regions. Taken as a group, LGUs of the National Capital Region, CALABARZON, and Central Luzon were found to be the most self-reliant while the Autonomous Region of Muslim Mindanao, MIMAROPA, and Eastern Visayas were ranked poorly. This may be due to the differences in the revenue performance of provinces, cities and municipalities, the research noted. Furthermore, it found indications that LGUs have a low degree of revenue autonomy, which refers to their power to determine their own expenditure based on their local needs. A low revenue autonomy causes some LGUs to fail in delivering even the most basic services to their constituents. This is why NEDA argues that there is a need to enhance LGUs’ revenue autonomy: so that they can allocate public funds and deliver the necessary social services to their constituents.